If you need a cup of coffee for breakfast try, the world’s most robust coffee, death wish ground coffee. The product is made from superior quality green coffee that is organically produced from farms that are Fairtrade and USDA certified. Consistency in flavors is guaranteed through the tasting of every batch. You can’t wait to get the first sip of this superior quality coffee. Small batch roasting ensures that you get fresh coffee every time you want a cup of smooth, yet strong and delicious coffee with an excellent aroma. It is highly caffeinated, with a great taste, which is not bitter. The death wish strong coffee comes already ground for your auto-drip coffee maker. Folgers coffee has been in existence since 1850. It has been enjoyed for long as part of morning breakfast and other moments in the family. It is made from mountain, grown coffee beans with the most robust aroma in the world. Enjoy your fresh cup of Forgers classic roast ground coffee. It offers pure, creamy taste that is consistent. For a classic, fresh aromatic coffee, try Folgers classic roast ground coffee. It is of medium roast and comes in different packaging from which you can choose from. Some of these include; instant single packets, K-Cup Pods, canisters, among other forms. Folgers works with UTZ certified suppliers to purchase excellent quality green coffee beans. It has high levels of caffeine one of the key features that identify it. Compared to standard coffee brands, the Valhalla Java ground coffee has better flavor and a smooth mouthful. The coffee beans are skillfully selected and roasted by specialists to come up with bold and smooth coffee. Valhalla Java ground coffee is packed in bags befitting the Viking gods. It is both Fair trade and USDA certified organic; this is a guarantee of the quality of coffee you are sipping. Peet’s as a company has links in the dominant coffee growing regions in the world from which they source their green coffee beans. The beans are selected and roasted by experts in small batches, ensuring that only top-grade beans are part of Peet's coffee. This results in bold and rich roasts with the unique taste and flavor traditional of Peet’s coffee. The beans are roasted the night after the order and shipped the following day. This guarantees that as a customer you get the freshest coffee possible. Brew it as an exquisite espresso or a French press. Lavazza Ground Coffee blend is packaged in 8.8-ounce bags and is of medium roast. The blend is best brewed for espressos, though you can make it using any coffee machine. Regardless of your coffee brewing technique, you will enjoy your cup of Lavazza Crema e Gusto ground blend, espresso dark blend. It is not exclusively Arabica coffee as it has 70% Robusta coffee beans. It is an excellent balance of the two coffee beans, resulting in a strong caffeine taste and a chocolate flavor. Other Lavazza flavors include whole coffee, dark roast, and crème. This unique blend has a nice aroma, and exceptional rich flavor. Since 1979, Victor Allen has continued to source top grade, finest Arabica coffee beans from different parts of the world to come up with this mild, smooth coffee. It is made of 100% Arabica coffee. The beans are carefully selected and roasted by professional to come up with a well-balanced, smooth coffee. To preserve the unique flavor and taste of the Victor Allen brand the beans are roasted in little batches. With the victor Allen brand, you enjoy every sip of your coffee until the last drop. It is kosher certified medium roast coffee, made through single cup technology and fits with the Keurig single cup brewers. Illy Caffe is an Italian coffee blend, usually packed in 8.8 ounces. It comes in hermetically sealed pressurized cans to preserve the freshness of the ground coffee. The brand is a blend of 100% Arabica coffee beans sourced from coffee growers in different parts of the world. Illy caffe comes in three different flavors Mocha, dark roast and it is of medium roast. For a strong cup of coffee try the dark roast variety. It has a smooth taste, ideal for your espresso brewing. Since 1964 Tim Horton has endeavored to serve its customers with an always fresh ground coffee. This brand is made from select coffee bean from the top coffee growing areas in the world. Tim Horton 100% Arabica coffee is to be served in 20 minutes after you brew. As a lover of fresh coffee make your cup of this brand in your home or office and enjoy its distinctive taste it to the last drops. Tim Horton 100% Arabica Medium roast is best prepared with automatic coffee makers. This is a unique balance blend, of medium roast that is smooth. The primary emphasis in the production of Bulletproof coffee is to ensure that this coffee is free from toxins. The toxins affect your health and may deprive you the pleasure of enjoying your daily cup of coffee. The Bulletproof upgraded coffee beans are grown Guatemala highlands. The final product undergoes a series of tests to make sure that it meets Bulletproof purity and quality standards. Roasting the carefully selected green beans increases the capacity of the antioxidants in the berries. The beans are roasted in small quantities for the best flavor and taste. You will realize the difference of this brand from the rest as you continue sipping your first cup. For the superb quality coffee, you will spend little more coins. The blend is available in 12 different pack sizes from 12-40 ounces. It is processed from 100% Arabica coffee beans, sourced from different parts of the world, chiefly Indonesia, central and South America. The beans are sourced from rainforest certified coffee growers. the Caribou coffee Caribou blend has a rich taste which is fruit, spicy as well as bittersweet. The blend is bittersweet and has adequate acidity associated with coffee drinks. If you like bitter coffee blends, then Caribou coffee blend is made explicitly for you. If you are interested in supporting products that are produced by companies that mind about environmental conservation, then Tiny Footprint is one of them. The company was formed in 2010 by several coffee artisans with negative carbon drive. This move entails Funding forest conservation efforts in Ecuador’s Mindo cloud forest. 4 lbs are required for the production and distribution of 1 lb. of coffee. The forests, will in future counter the adverse effects of CO2. The coffee beans used in the production of Tiny footprint organic cold press coffee are sourced from farms and cooperatives that are Fairtrade certified, and third-party accredited farms by Onecert. The coffee beans are roasted in Probat drum roasters that were developed in Germany in the 1960’s but are incorporated with modern fuel –efficiency technology to produce consistent batches of roasted coffee. The brand is produced from 100% Arabica coffee, to produce coffee that is sweet, with a rich flavor and cocoa like body. ​In 1895, Luigi Lavazza, the founder of Lavazza coffees came up with the art, the four generations have perfected the art, to what we have today. If you want to know why the Lavazza’s have dominated the coffee industry in Italy, then try any of their brands, with Lavazza Caffe Espresso Ground coffee blend been one of them. In Lavazza, the process of production is thoroughly checked to ensure that the products are of the top and consistent quality. This Caffe espresso blend is made from % 100 Arabica coffee from Africa, South, and Central America. Though it is best for espresso, you can try it for other forms of coffee brews. It is an aromatic dark-roast blend with a unique flavor. No matter the method of your brewing, you will enjoy your cup of Lavazza Caffe espresso ground coffee. A great way to start your day is with a cup of Folgers Breakfast blend ground coffee. This is a mild roast coffee variety, with a fantastic taste and a creamy fresh aroma. Folgers presents its coffee brands in different forms of packaging. You may choose instant-single to serve packets, canisters, K-Cup pods any other from the range of packaging formats available. Folgers sources its coffee beans from UTZ Certified growers to ensure that they get top quality beans that have been grown in an environmentally friendly way to guarantee sustainability. This is a smooth blend of 100% pure coffee produced in the highlands. This is a blend of coffee and chicory, the same quality as what is served at Café Du Monde, New Orleans. The New Orleans French coffee market has been in existence since the, 1880’s. It is a blend that is easy to prepare and serve. then you know the quality I am talking about. For an amazing cup of coffee, try the Café Du Monde Coffee Chicory. Community coffee started in 1919; Four generations have continued to ensure that you get the best quality coffee ever. The coffee beans are selected, roasted and blended in a superior way to come up with a top-notch product in the name of Community coffee premium blend. The blend is made of 100% Arabica coffee to a smooth, rich taste. Community coffee bears its name to the dedication it has to serve its community of customers. Community Coffee Premium Ground Coffee Breakfast blend is of medium roast, with a rich aroma and a smooth finish. The Lavazza family has for years been in the business of producing premium quality coffee brands in Italy. Their dominance in the coffee sector has been due to dedication to selection, blending and roasting of high-quality coffee beans sourced from different parts of coffee growing areas in the world. It is a unique blend of African and Brazilian Robusta and Arabica coffee to produce coffee that is consistent with quality and quality. It is ideally brewed as an Italian espresso, though you can try other methods of coffee brewing. Mocha and French presses are some of the other brews you can try. For real Italian coffee, try the Lavazza Qualita Rossa ground coffee blend. It has a bold, bright finish that has been masterfully crafted lying between the sweet-smoky flavor of French roast and bold, bright taste of Colombian coffee. It best brewed using the Keurig brewing system or single brew cups. The Barista Prima Decaf coffee, Italian roast is dark roast and has been decaffeinated. It is Kosher Orthodox union certified. The brand is made from the worlds carefully selected, blended and roasted Arabica coffee beans. It has a dark, pleasant flavor and a smooth finish. If you are a fan of decaffeinated coffee, try the Barista Prima decaf coffee. The Coffee bean direct is characterized by full-bodied coffee, with a rich taste and medium acidity. It is packed in foil-lined bags to preserve its freshness. For any coffee, lover freshness is of utmost importance since it lets you enjoy the real flavor of your cup of coffee. It is a blend of coffee beans grown in North and Central America as well as India. The blend is prepared in small batches for high quality, flavor, and consistency. Dark roast coffee has become more popular today. For a great cup of dark roast coffee, Coffee bean direct Italian roast espresso will be ideal for you. With honey and toasty aroma, coffee bean direct Italian roast espresso is designed for espresso as the name suggests but you can still prepare your delicious cup of coffee through other types of brews like the French press, reusable K-cups, pour over, percolator, and also drip coffee makers. What makes Tim Horton’s 100% Arabica medium roast coffee unique is the selection of choice coffee beans from world’s best coffee growing regions. The company Tim Horton’s has been in this business since 1964, they, therefore, can boast of a wealth of experience in coffee blending. This exclusive premium blend is made of 100% Arabica coffee beans. It is easy to prepare, in less than 20 minutes you have your perfect cup of fresh, great tasting Tim Horton’s coffee. The main idea behind the Tim Horton’s coffee is for you to have fresh coffee at all times. It is best prepared using automatic coffee brewers. Have you ever thought of an ideal gift for a coffee fanatic, then Death wish& Valhalla Java whole beans coffee bundle will be one? The beans have been selected and roasted by experts to a smooth and bold. Enjoy your cup of coffee bearing in mind that you are drinking premium organic coffee that is both USDA and Fairtrade certified. Whether you want to prepare your cup of coffee at home or in the office, Death wish & Valhalla Java whole beans bundle will be perfect for you. Buying this bundle, you will save some money that you can use to top up on your other purchases. You will never go wrong by grabbing a cup of Café Britt Tarrazu Montecielo ground coffee. The beans are sourced from Costa Rica’s Tarrazu region, an ear that is of high altitude and fertile volcanic soils supporting the right climate for the production of superior quality coffee. The select Arabica beans are handpicked, dried in the sun and roasted by specialists to come up with the unique taste of the dark roast coffee. It has a flavor similar to grapefruit and cocoa and dark chocolate or aged wood aroma. These are some of the reasons why the Café Britt Tarrazu is a darling of most top chef’s world over. The coffee has sharp acidity and a unique and appealing flavor. New Orleans is known for its unique flavor and aromatic coffee blends. The brand is a blend of coffee and chicory. It has its roots in the 1800’s war times where the coffee drinkers mixed their coffee with roasted chicory roots to save their diminishing coffee stocks. It is ideal for breakfast. Being full-bodied, the Café Du Monde, 15 oz., has a delicious and robust flavor. You don’t need to visit the New Orleans to enjoy this unique flavored coffee, but if you ever visit the place, your cup of the Café Du Monde will act as pleasant memory of the area. Stone Street started roasting coffee back in 2009 and is located in the center of Brooklyn, NYC. The company boasts of being among the stars in the business of handcrafted coffees. Their coffees are sourced from top coffee growing regions of the world. If you pride in taking premium coffee brand, from select beans and with excellent taste, then Stone street brands are made for you. The beans are 100% Colombian supremo. The brand is dark roast ideal for cold press and is less acidic when you compare it to hot coffee. For a relaxed well-balanced and bold and robust flavor try Stone Street coffee cold brew reserve Colombian single origin coarsely ground coffee. If you prefer blends, it may not be for you since it is made from single source beans. Lavazza Qualita Oro Ground Blend Is another supreme brand from the Lavazza’s. It is a mix of Arabica coffee beans from African and Central America high –altitude coffee growing areas. It is medium roast with a unique aroma. You will notice its golden crema with every sip. It is ideally designed to be brewed in the traditional Italian espresso, though you can sue the mocha pot, drip coffee maker or French press to prepare your cup of this amazing coffee. Grab you Lavazza Qualita Oro ground coffee blend for a unique experience. Grove Square prides on making beverages that are harmonious with 1st generation Keurig K-Cup Brewer. The brand consists of 24 single serve cups of French Vanilla, Caramel or Hazelnut. With this pack, you can enjoy your coffee shop experience at home at the time of your convenience. It is easy to prepare thus suitable for your busy moments. To guarantee that you are using a product of high quality, the Grove Square pack, is Kosher certified. The coffee beans used for this brand are sourced from farmers who are members of the Columbian national coffee growers association. This is an association that has succeeded in the production of high-quality coffee. The product is 100% Colombian, meaning that it is a single origin. The supremo beans are finely ground resulting in a well-balanced aroma and taste that is uniquely Colombian. Originally made in Joure, Netherlands by Douwe Egberts, through a special Egberts' roasting process. Packed in a red as depicted by "Rood", vacuum filled packaging, so you can have the freshness preserved once opened. It uniquely combines the Robusta and aromatic coffee bean richness for a fragrant and spicy taste. Offers a wide variety of alternatives thus cutting across a wider range of consumer. It is moderately roasted and grounded hence possible to be prepared manually or by use of a coffee maker. Leaves a thick feel in your mouth due to its full body, which is a great alternative to dark roast coffees. Addition of milk and sugar is optional according to one's preference but the Aroma Rood possesses its own special sweetness. Its other major unique characteristic is that not only can it be served for breakfast but as a pre-course for grilled steaks. Looking to have a great morning kick start? Well, Cameron's Organic French Roast coffee is simply the deal to settle for. It beats other coffee brands in that it is organically processed hence free of herbicides and other chemicals used in the due course of production. Organic French whole beans roasted in sizeable quantities to give the desirable dark and rich outlook. Craftily blended and to perfection, It's sweet and chocolaty aroma will tingle your taste buds to provide you the satisfactory aftermath. It has a strong, rather unusual smooth bittersweet tang that is simply deceptive to you, the coffee lover. You will find its attractive package lined with foil to ensure the freshness and aroma are intact under the required storage conditions so that you enjoy the same great taste over time. If quality is your trademark, Cameron's Organic French roast has nothing less than perfection. Wicked it is! 100% Arabica raw coffee and organic certified. Can be shipped internationally with a pre-ground form option for coffee lovers who would love to go the espresso way. It has no struggle to preserve the freshness as it vacuum preserved with a resealed sticker, one touch and viola all goodness locked up. Read on! Its delectable flavor gently hits the taste buds, arousing the feel of contentment after downing that very first sip. A finely pressed Wild Jo will spot a dark brown look due to the presence of dark cocoa and brown sugar. You can use Wild Jo to prepare coffee-based desserts and iced coffee, as it gives out the best of its quality however you choose to have it. It has maintained its quality amidst name change over time. Ground from freshly picked and carefully handled grade ‘A' coffee beans from the Highlands of Brazil and Colombia, Koffee Kult Medium Roast delivers the best coffee drinking experience as is expected from a brand of its caliber. The tantalizing aroma fills the room beckoning you to take your first sip. Your taste buds are sublimely hit by the earthly and refined flavors as you sift through the mild texture. The coffee's authenticity and perfectly balanced chemistry between the texture and wholesome goodness is not only bound to have you itching to become a caffeine connoisseur if you weren't one already as you near the last drop, but also give you the much-needed boost to begin your day. Picture this, rushing on a busy Monday morning when the time is not your friend. But in the middle of all that chaos, all you can smell is the vanilla scent lingering in your halls. It is the aroma of the fresh cup of coffee in your hands, your Grove Square Cappuccino. on your way to work, you quickly down the remnants of your Grove Square Cappuccino and carry the rest of the delicious coffee to go. Prepare to be utterly spoilt by the 24 single serving cups at your very own disposal. What is even better is its convenience. Trust me you will find yourself craving for another cup any time you are at home. This whole sweet vanilla and bold coffee flavor ensemble have morphed together perfectly and synchronized beautifully to form this delightful cappuccino. Sometimes getting out of bed in the morning does not necessarily mean that you are awake. Sure a quick shower might just do the trick and awaken your groggy self but for that much needed extra kick, a cup of Victor Allen Coffee ought to set the pace for your entire day. Victor Allen Coffee is a medium roast Arabica coffee that exquisitely blended the taste of the coffee beans with the hazelnut flavor. This brought together a rich and sweet cup of coffee which is sure to help keep you alert in the morning. The coffee has a smooth texture and fine consistency. You will barely notice yourself adding more coffee to your cup but you will definitely recognize the taste once it touches your palate. With so many coffee brands in the market today, choosing the best brand might be an uphill task for you. The following considerations will help you as you choose what to buy. The flavor of the coffee is one of the most important things to consider. This depends on the type of coffee beans used, their origin, and the type of roast and if there are other ingredients used to spice up the flavor. Coffee is known to have originated in the eastern Africa highlands; most stories lead to Ethiopian highlands. Many roasters source beans from different parts of the world to come up with blends. The method you will use to prepare your coffee is primarily dependent on the grind. Medium ground coffee is best made using auto drip or manual coffee machines. On the other hand, fine grinds are suited for cone filter papers and drip machines; espresso machines require coarse grinds. There are three main types of roasts, the light, medium and dark roast. The three also have variations. The light roast has high acidity and sour flavor, the medium is lesser acidic with a bitter-sweet taste, while the dark roast has more acidic and sour. Espresso requires the dark roasts. Coffee production should be done ethically, to ensure that the rights of the farmers and the environment are protected. We advise that you support products that are Fairtrade or Rainforest certified. Will My pre-ground coffee remain fresh if I keep it in the refrigerator? - After grinding, coffee starts to stale. No matter how you store it in the refrigerator its flavor will change, that is why you should not opt to store your pre-ground coffee in the refrigerator. Insist on ordering fresh ground coffee. Does your coffee have any certification? - There are a number of certifications that promote ethical production and distribution of coffee, major ones are Fair trade and Rain forest alliance. Check if your brand has any certification. Is it fine, medium or coarse grind? - Check your brand to know the type of grind. It is usually indicated on the package and description. - For each pack there are specifications on how to prepare you coffee. Understand this before you make your purchase. 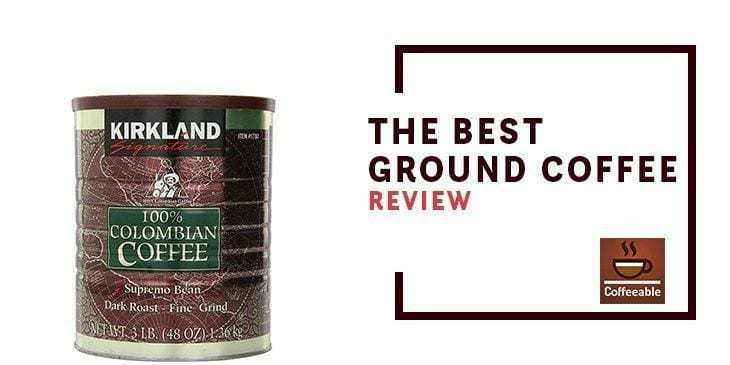 Though selecting the best ground coffee can be an uphill task for any coffee lover. We advise you to choose any of the brands we have discussed considering your method of preparation and the guiding factors on selection. Continue enjoying your best ground coffee as you sample the various brands we have highlighted.